There is a difference between RV camping and RVing as a lifestyle. RV camping is more of a casual use of an RV, vacation and/or weekend trips. Where RVing is a lifestyle, usually living in the unit either full time or part-time (around 6 months of the year). This lifestyle is not restricted to either the “rich” or retirement community, but you will find young couples and families also. RV camping is a pretty common form of camping. It is especially preferred by people who are not looking to roughing it, but still what to enjoy the great outdoors. And for some, to have a luxurious experience. 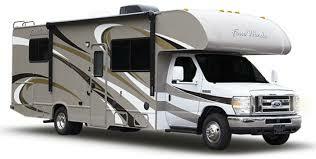 RV vehicles come in different types and classes. By the end of this article, you will be able to choose the perfect RV vehicle suitable for your requirements. Class A, Class B, and Class C.
Class A is the most luxurious of the 3, with its roomy interior and plenty of storage. The inside can become even more spacious with the addition of sliders. It is usually built on either a bus chassis, commercial truck chassis, or a custom vehicle chassis. The engine is a diesel (pusher) or gas. It can accommodate 2-4 people, with some units (bunkhouse models) 6-8, with enough sleeping room for everyone. With luxury comes a higher price tag as well. It is least economic in terms of fuel, (8-10 mpg). Class B is not very spacious and commonly called camper vans. You do get a bedroom, kitchen, living room space, toilet, and shower as well but it is not very roomy. Storage is at a premium. It is the least expensive of the three classes. Class B RV is the smallest in size and hence, comes with the best fuel economy. Also, they are the easiest to drive with the keyword economical. Some of the newer models give you the option of going with a diesel. Class C can accommodate 4 to 8 people. It is a good in-between of the Class A and Class B in terms of fuel economy as well as luxury. They are built with a cabin chassis and many have slide outs to increase living space. Depending on the unit, the over-cab area can be a sleeping area, entertainment area, or storage area. The fuel economy is between the Class A & B, and with the newer models, you have the choice of diesel or gas engines. These RVs are connected to a tow vehicle via a 5th wheel coupling hitch or a gooseneck connection. The tow vehicle is usually a heavy duty truck, ¾ ton or more. These are a great option if you’re looking for something to explore around in while offering a spacious living space, up to 5 slide outs. With it’s many roomy interior optional layouts, you also get plenty of storage. A drawback is you are limited to the number traveling, dependent on the passenger capacity of the towing vehicle. Toy hauler is also called the Sports Utility RV trailer. It allows the passengers to carry things like ATV, dirt bikes, etc. along with them. 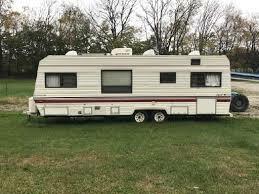 These RVs are usually divided into two parts. While the front part serves as the living space, the back portion is used as a loading space. This does minimize the living area. The reason some people opt for this RV for its dual purpose. It can be customized by adding more or fewer utilities. These RVs come with a lot of living area space. The specialty of these vehicles is that they can tow with many types of vehicles. 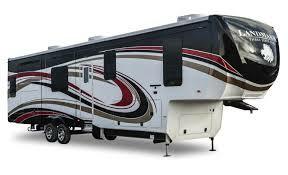 Along with that, travel trailers are less pricey in comparison with other big sized RVs. Its big size does make it hard to travel through narrow areas. Users have the option to add more luxuries or to keep it simple. Pop up RVs are a great option if you’re low on budget or if you’re new to camping. They are lightweight and very easy to move around. Along with the easy maneuvering, they are also pretty economical in terms of rent and fuel consumption. The best part is that they are spacious enough to give a comfortable experience. These are some of the most commonly used RV vehicles. Now that you know the basic pros and cons of each one, you can opt for the best option on your next camping trip! © 2019 CampingGear.Supplies. All Rights Reserved.